One last fun recipe to use up that rhubarb, ok!? My rhubarb just seems never ending this year – which I love! 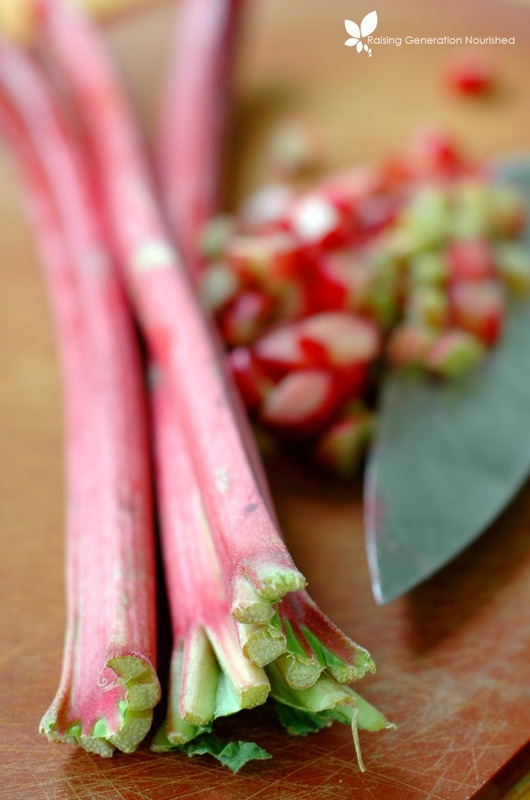 Usually rhubarb is thought of to use in desserts and other treats. 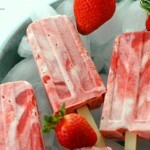 We have a lot of fun enjoying our strawberry rhubarb creamsicles every May! But since I like to keep treats at a minimum with growing kids in the house, I usually try to come up with something different, but useful to use it up. Last week the baby had me by the hand toddling around the yard and I noticed my rhubarb definitely wasn’t done producing like I thought it was! We picked the last handful together and I decided to make it a part of breakfast that week. 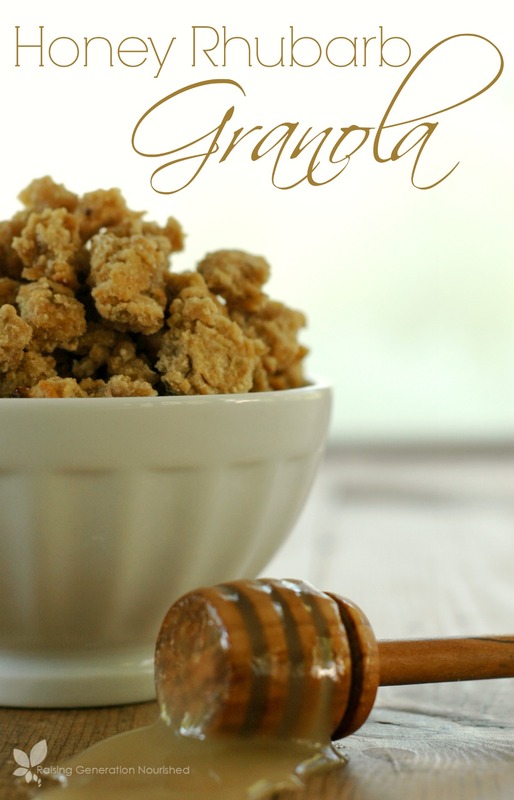 Granola seemed logical for the time of year, as we are headed into warm, muggy mornings here in the next few weeks. 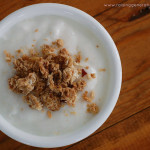 I love using granola cereals on those mornings so I’m not turning the stovetop on! 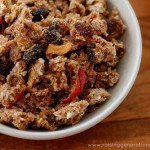 I keep simple cinnamon granola stashed in the fridge for those mornings I don’t want to cook, and also this grain free granola to change things up a bit. 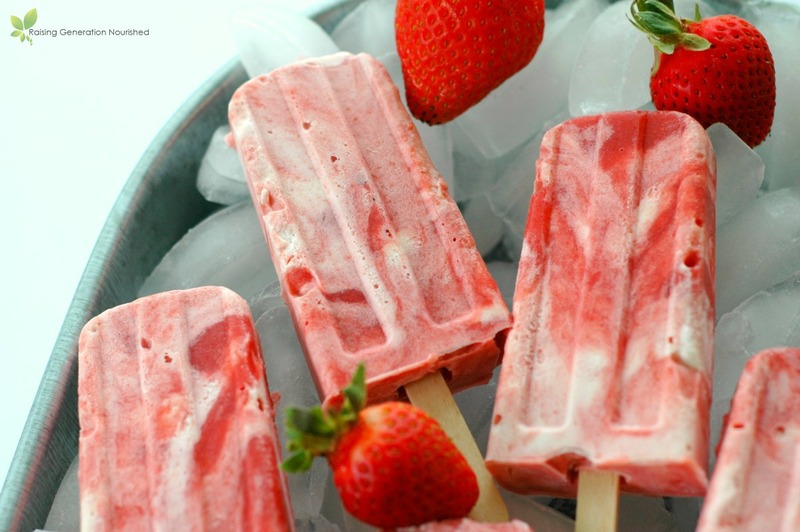 I know that rhubarb is often thought of paired with strawberries, but one of my favorite flavor profiles is actually honey and rhubarb. We get the most beautiful raw honey packed with amazing vitamins, minerals, enzymes, & antioxidants from a local farmer and the flavor is so amazing. 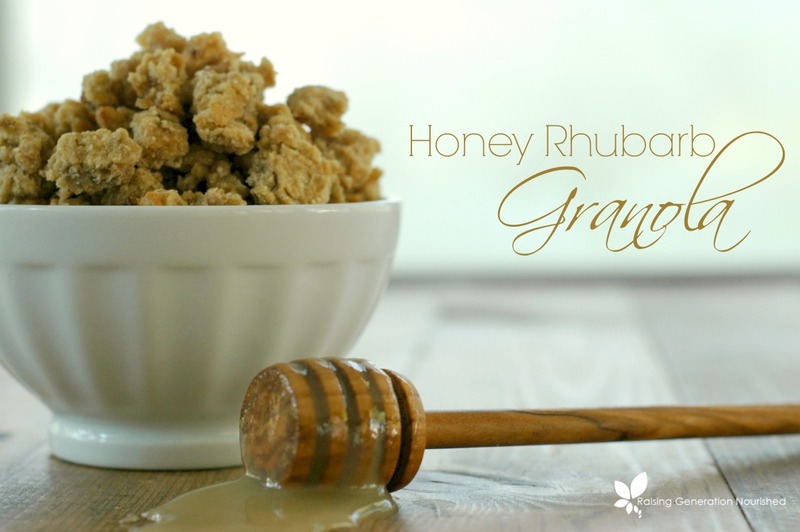 And this mineral rich, sweet raw honey mixed up with tart rhubarb is a delicious start to your morning meal! Oh! And you can sub sour apples if you don’t have access to rhubarb! 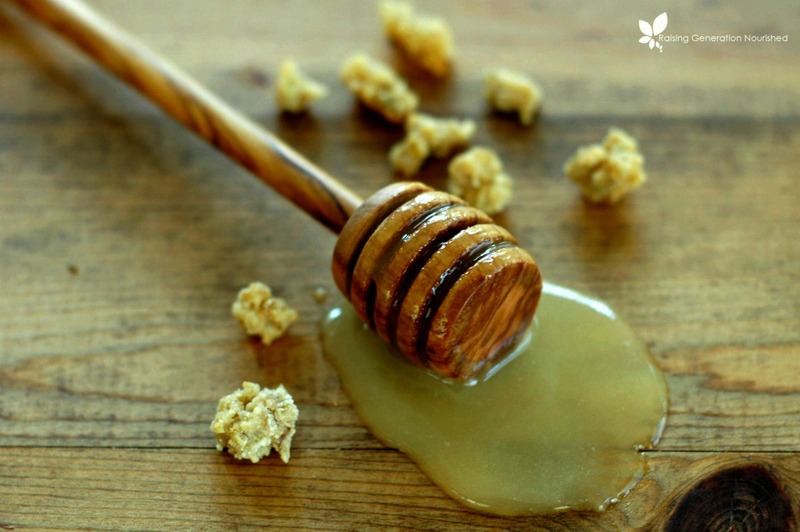 I would recommend using honey that you wouldn’t mind taking right off the spoon as you will taste it in the cereal. There are some local honeys around here with much stronger floral undertones that I don’t care for so just be sure you pick something you love! We like to splash on raw milk or coconut milk and I usually have hard boiled pastured eggs on hand to serve alongside. It is a great summertime breakfast! 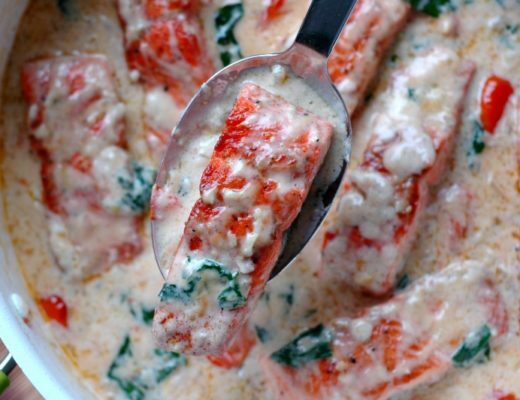 It also works well to top yogurt or coconut yogurt! A quick note on the cook method! I love my simple dehydrator ! You can use your dehydrator if you have one, and if you don’t, just bake it in the oven stirring every so often so it doesn’t burn on the bottom. See the recipe below for details. I love granola best on hot summer mornings so I don't have to use the stove. 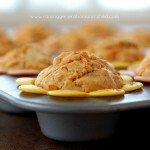 3 cups rhubarb chopped (I just buzzed mine up quick in the food processor. If you don't have access to rhubarb try a similar flavor like green apples! 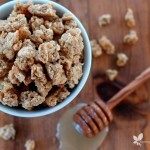 Put the oats, water, and lemon juice in a large mixing bowl, combine, and set in a warm area over night or 8-12 hours. Strain off the water. While the oats are straining put the rest of the ingredients in your large mixing bowl, add in the strained oats, and stir to combine. Spread out on your dehydrator and dry out at 110 degrees 8-10 hours . When it is done break it apart into storage containers or freezer bags. I like to keep grains cool so they keep better so I store mine in the fridge or freezer especially if it is the summer. If you don't have a dehydrator, you can bake it in your oven around 300 degrees for an hour, just stir it around every so often so the bottom doesn't burn. 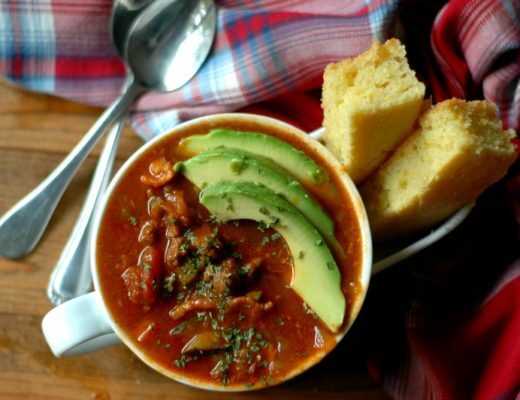 Instant Pot Chipotle Chili :: Stove Top & Slow Cooker Directions Included! 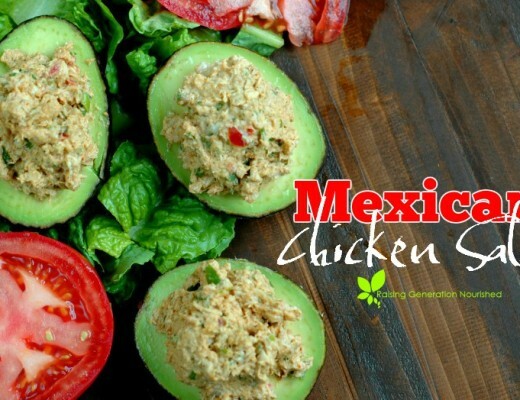 Bean free & Paleo friendly too! Oh yum! Such a good idea. This sounds delicious! What a yummy idea. This looks great. 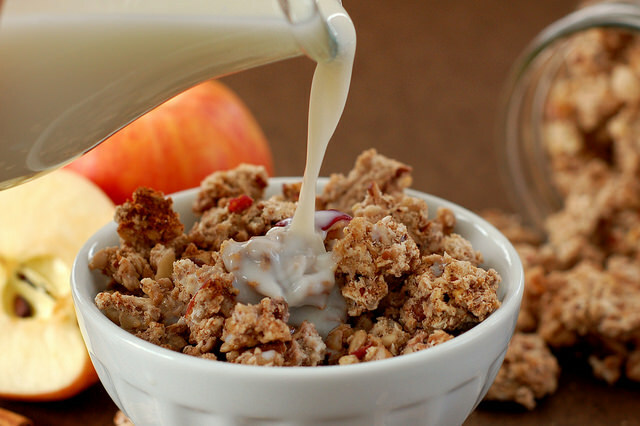 I love the idea of adding rhubarb to granola. Thanks! 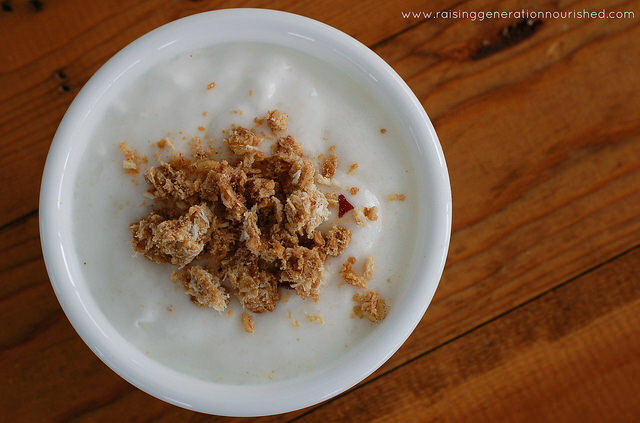 I love the idea of adding rhubarb to granola– definitely an unusual breakfast food, but I think it has such a great flavor, and like seeing such a creative use! I have to try this. I have rhubarb in my; garden and don’t use it often. This looks really good. I am also pinning for later. So unique! I love all your special recipes 🙂 This one sounds yummy! 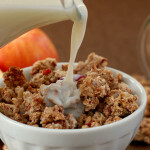 This is such a unique recipe – I love granola and rhubarb (Strawberry Rhubarb Pie is my favorite) so I cannot wait to try this! I love that it’s gluten-free too! I love this idea! I need to hunt down some rhubarb at the farmer’s market this weekend 🙂 Love that it is gluten-free. Can anything be used in place of rice flour? Hi Ashley! 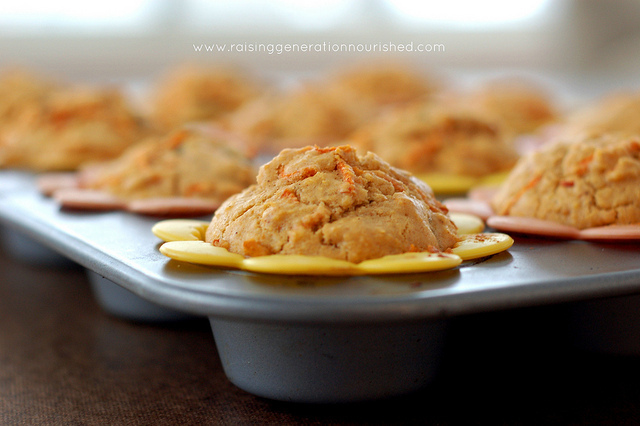 Yes you could use more almond flour, or sorghum flour works too. Or you could add more oats to the soaked oat mixture. I hope that helps! How long would it take to cook it in the oven? This is currently in my oven half way done. I have to say I think it’s going to be a huge fail. Not sure what I did wrong, but it is supposed to be a big sloppy mess when you spread it on the cookie sheet? I’ve never made granola before from soaked oats, so this just looks like a big flat muffin. But not a GOOD big flat muffin. There is no way making this in the oven is going to make it dry and crunchy. What gives? You have to give it time to dry out in the oven. Yes it will be all one big piece for a while. You will have to stir it and break it up along the way. As it cooks and drys out it will be easier to see how it will be like granola – give it enough time. Also it will harden more as it cools. Hi Sophie! The texture will be different, and it will look different than these pictures, but yes, I think that would work! I love your recipes, they are so tried and true. Thank you for sharing!! I’ve made a few of your granolas. I love how you use flour, it makes the texture unbeatable.! 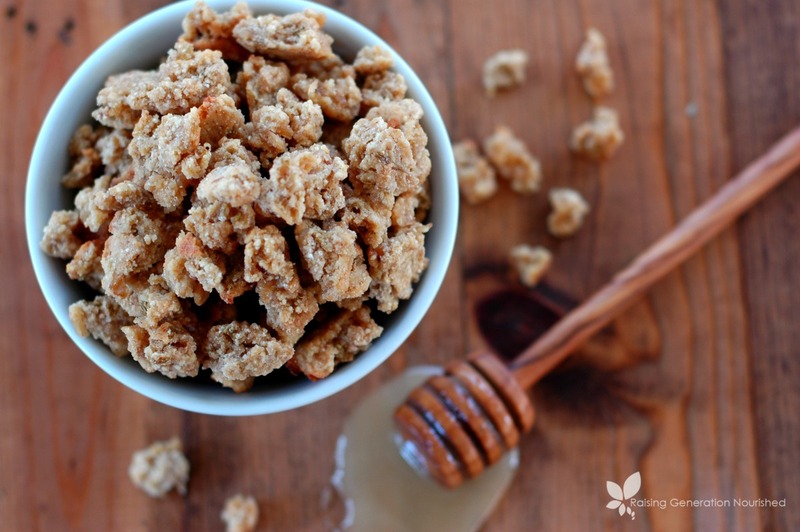 For this recipe I use pecan flour for the almond and I will try swapping something for the coconut flour (I can’t tolerate either of those). Maybe another grain flour or tapioca flour? Any suggestions? Hi Amanda! 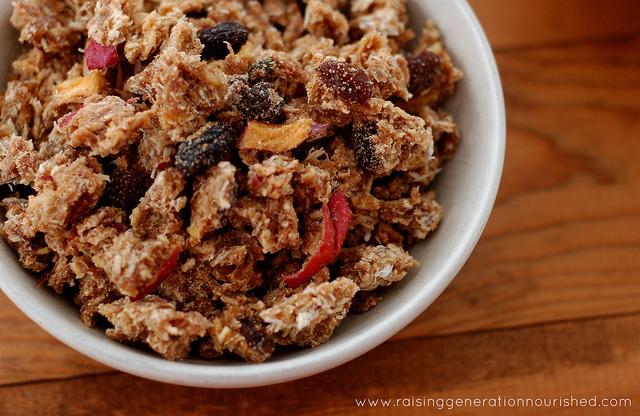 Yes, tapioca or really any grain free flour would be fine – granola is super forgiving. And yes, the applesauce will be fine!